Acknowledging one man and his team. For years I have found I have had to battle and prove myself to my sports coaches if I am wanting to play in a team, also prove myself to teammates that I won’t let them down if they pick me over another player who would 100% be able to last an entire match. I guess this fight started when I remember as far back as 2003 when the team was being selected for the school tour over to the east coast of America. I was taken aside and spoken to that if I was selected I had to prove I was well enough to go and play the matches. Until then I never thought my position in a team was judged by my health rather it was my ability and skill playing the game. I guess the only exception to this was ski racing where without sounding arrogant and big headed there was no one in school who could come close to my times. Now looking back on it I can see that my position was always given to someone else if I had recently had an asthma attack even if I was given the green light to play again. I would often be missed off team lists altogether. Despite turning up to all training sessions even putting in extra hours of skill work and extra hours of fitness it felt like it was never good enough. Even playing club sport I would be questioned about if I was fit enough to play and if I was sure. Even if I had the green light from respiratory I would still be questioned and people didnt feel safe me playing. It really made me feel pretty down as I would do all I could to get the green light from Dr’s, attend training but still it was questioned. But I must say that all changed and it all changed for the good!!! I wrote a while back that I found myself in goal again after 18 years playing out field in lacrosse I was once again between the pipes. 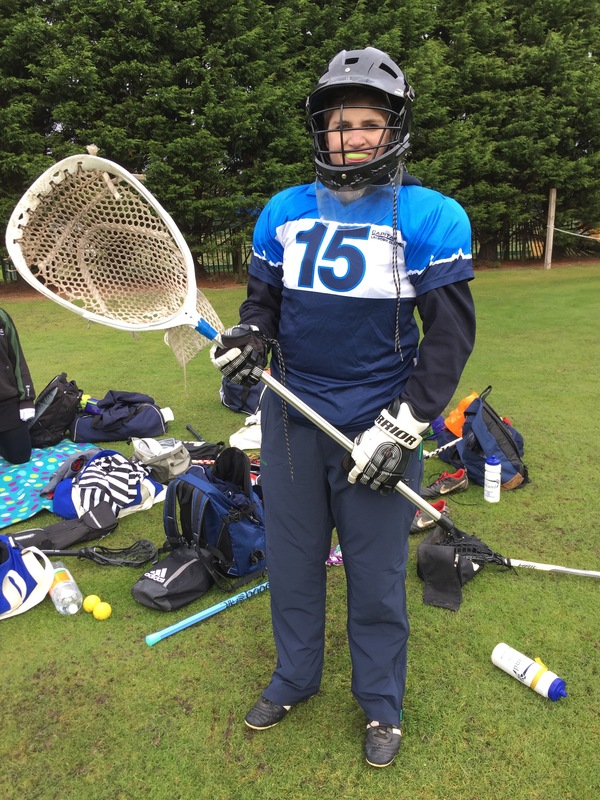 After that first tournament when I wore all the goalie kit we had and looked like an american footballer (i do not do this now as found it actually made less mobile). I found myself enjoying being in goal and found I could play and play a full hour with no bother on my chest and not be a risk to the team. As I knew this was a position I could play and the enjoyment I got from being part of the team again was great, I knew this was for me but I needed practice! Thankfully there was a Development day led by the Scotland national coach which I went along to as the more time I could get to practice was only going to make me better (and a bit more bruised). I was shocked when I was asked to stay for the second day which was for people trailing so I stayed. The weekends to come I stayed for the second day with the aim of trialling for the B team. I had to be upfront about my chest as this was not the place to hide it and there was no way I could do the fitness or keep up with the fitness that the rest of them were doing. For once the coaches were alright about it and understood. It was the first time a group of coaches understood where I was coming from and didnt force me to do something I knew I would fail at. I was really excited at the prospect of trialling and felt it gave me a purpose again to get better and try and keep on top of my asthma and not let it dictate my life. The final trialling weekend I was devastated when I ended up in hospital. I think I was more upset at the prospect of being on hospital for the trial weekend than I was about my birthday, this was how much it meant to me. I didnt tell anyone this but I guess i can now because it all turned out alright in the end. I accepted that once again my asthma had stopped me doing something and it was good while it lasted so had to be happy with that. In all honesty I don’t think i really dealt with the emotion of it all but because the previous admission was so scary and also the start of this admission has led to a formal complaint going in so my thoughts were all with this rather than the fact that I missed the trial day. 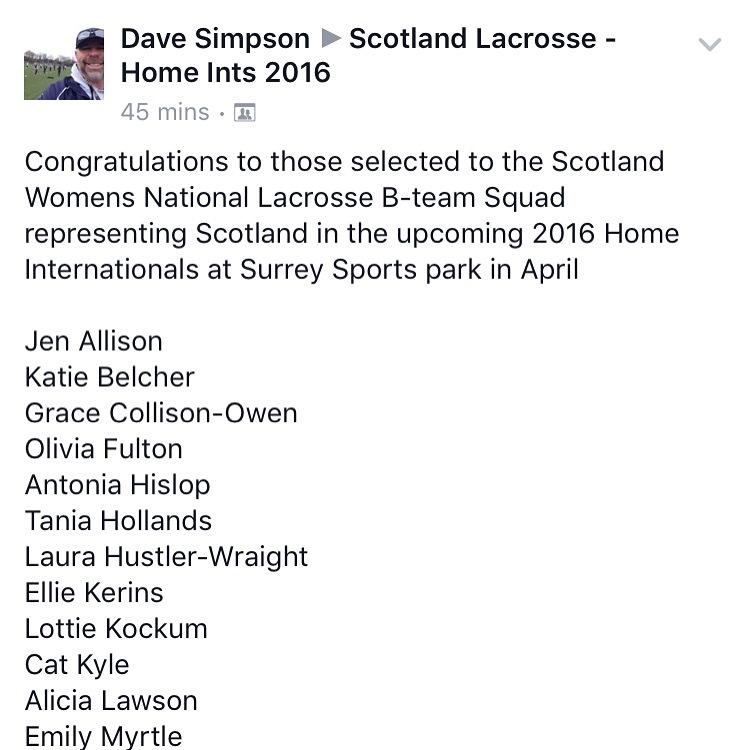 I was over the moon to see that I had been picked to represent Scotland in the B team for Home Internationals down in Surrey in April. I thought it was all over when I was in hospital so to say I was over the moon would be an under statement. I owe a huge thanks to the coaching team at Scotland for giving me a chance. This is the first time in as long as I can remember that despite my asthma I am being given a chance to play and the what if’s are not being asked. I guess this has given me a new lease of positivity and renewed fight where before there really was not much to fight for. Next weekend there is a coaching weekend which i am looking forward to as really starting to feel better after the start of the year which was interesting but having positive news and a goal makes it so much easier to get back to it. Tomorrow I go back to work for the first time in 2016 which I am looking forward to as have been very bored. It is a quicker return to work than normal after only being discharged just under 2 weeks whereas normally I am home 3 weeks as recovery takes a wee while but its time to go back before I go barmy with cabin fever!!! If I am honest I have not got my head around what has happened at the start of this year but knowing that someone has faith in me keeps it going. I owe a huge thanks for this but also the inspiration that the Scotland coach his. His passion for the sport makes you want to do your best and play well. It is like its contagious and totally infectious you cannot help but love lacrosse when you are around him and his team of coaches. The rest of 2016 is going to be a good year!!! Returning to work in a fog of smoke.